In this collection, Ireland’s most famous and iconic Celtic Crosses are recreated in exquisite detail. Each piece is handmade in Dublin by master craftsmen and captures in minute detail the essence of the original cross. Every Celtic cross pendant is hallmarked at The Assay Office in Dublin Castle, guaranteeing the authenticity of the piece and the purity of the metal. The Collection features the most significant high Celtic crosses to be found in Ireland. We offer free shipping and a full money-back guarantee on all our pendants. We know you won’t be disappointed as these are truly beautiful pieces of handmade Irish jewelry. 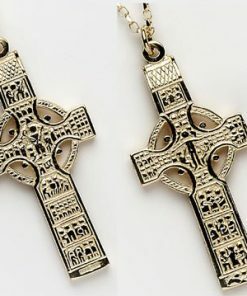 All of the replica cross in this section are double side and are also available in sterling silver, white gold and yellow gold. Choose from our collection of exquisite replicas of the traditional crosses that have stood in Irish monasteries throughout Ireland for centuries. These replicas can be worn as a symbol of fashion or of faith. The crosses are a distinctive statement of our Celtic heritage.